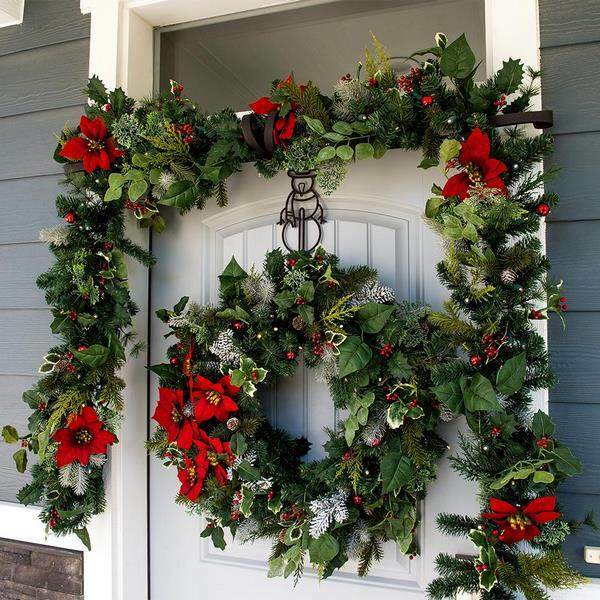 We have selected some useful tips and wreath hanger ideas for doors, windows, ceiling and walls. 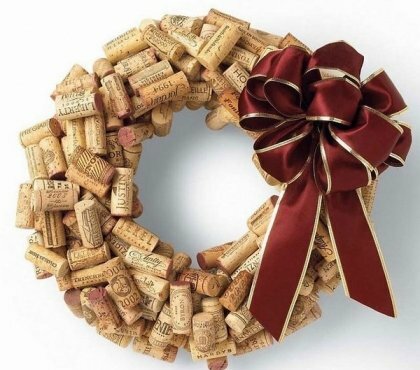 A wreath will help you create a festive atmosphere that welcomes your visitors right from the doorway. Decorative wreaths are one of the most popular decorations for every season and holiday – Christmas, Easter, Halloween, Thanksgiving, etc. Whether you bought a beautiful wreath or you made it by yourself, this is one of the main decorative pieces in every home. Wreaths can be hung not only on the front door. 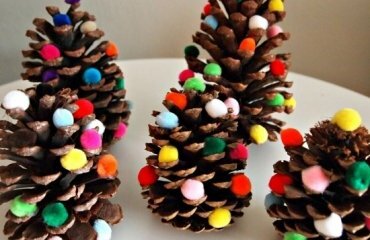 They can decorate your fireplace, your walls, they can float above the dining table and even be a spectacular centerpiece on your table. Nowadays you can find a huge assortment of hangers on the market – from simple hooks to stunning personalized designs which are a real work of art. By the way, make a note that such a hanger can be a great housewarming gift or a Christmas gift for your friends or relatives. Adjustability is one of the most important features to look for. Adjustable models allow you to use one and the same hanger for your front door or fireplace, for example, and will save you from hanging your decoration too high or too low. 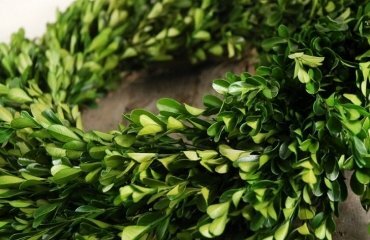 Flexibility is another important feature which allows you adjust the way your wreath is hung. 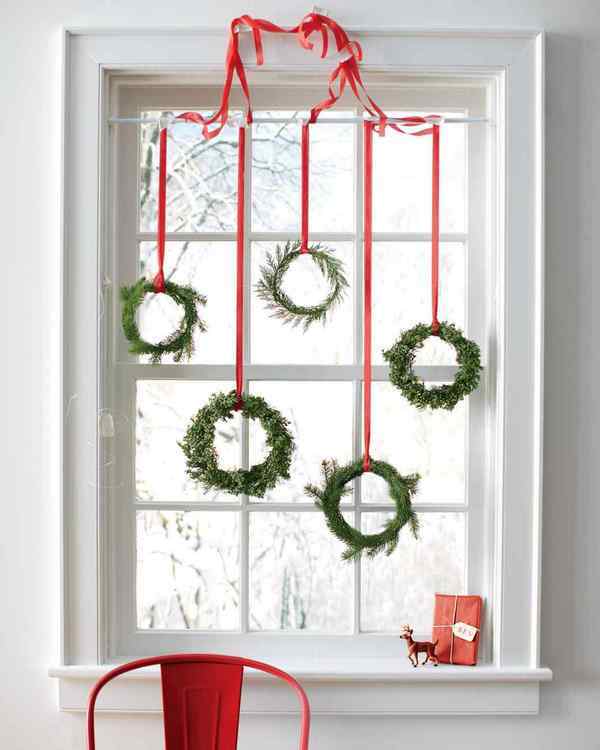 Metal hangers are not flexible, so a DIY wire hanger can be a good option, if you need to place more than one wreath. To make it look better, you could use a ribbon of any color to match the main palette of your wreath, for example – red or green for Christmas, burlap for autumn and Thanksgiving, pastel colors for Easter, blue or yellow for summer decorations, etc. Durability and sturdiness – these are especially important for outdoor decoration because they are exposed to elements like rain, wind, snow or frost. 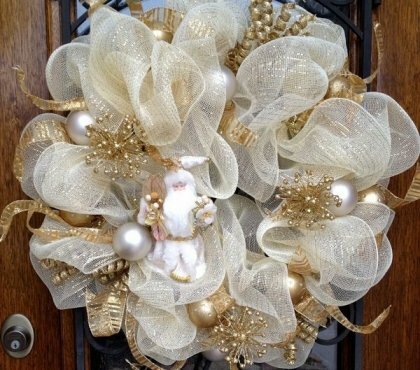 You’d want both wreath and hanger to keep their good look through the holiday season and resist strong winds or heavy rains. In addition, the hanger should be able to bear the weight of the wreath itself without losing its initial shape. It is even more important if you use one hanger for more than one wreath. Cost – of course, it all comes to the budget! 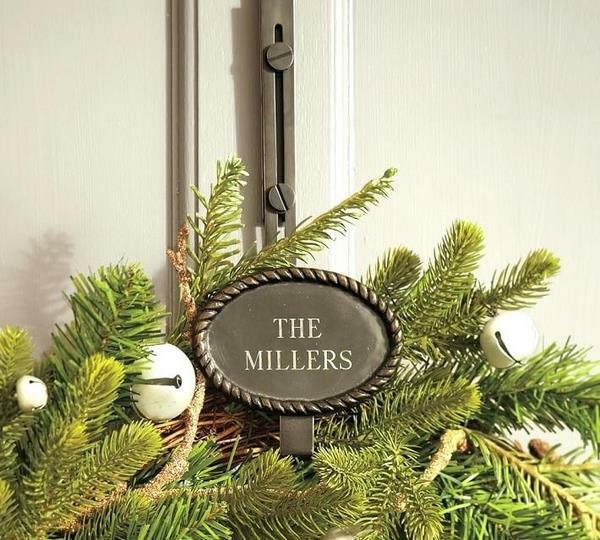 A great wreath hanger should meet all your requirements and come at a good value. There is no need to spend a fortune, of course, yet you should not buy super cheap hooks. Try to find a balance between quality and cost. 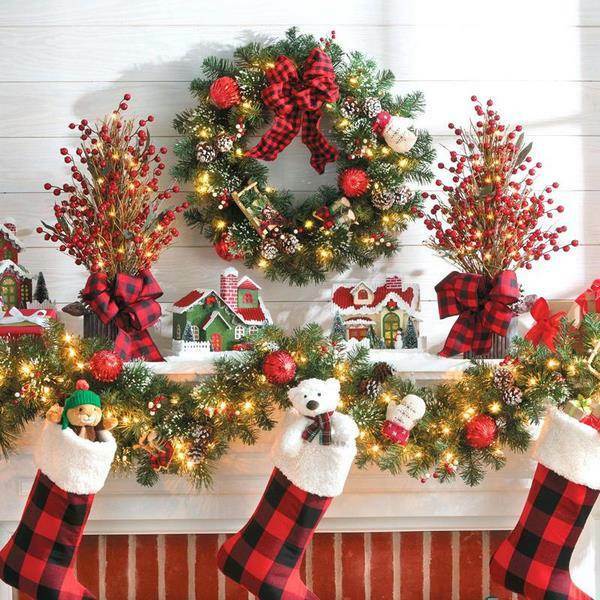 As we mentioned, there are numerous wreath hanger ideas and hundreds of models on the market. We shall look at different methods for doors, windows, walls, etc. 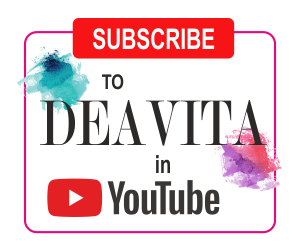 and will give you some practical tips which will be of help to you. 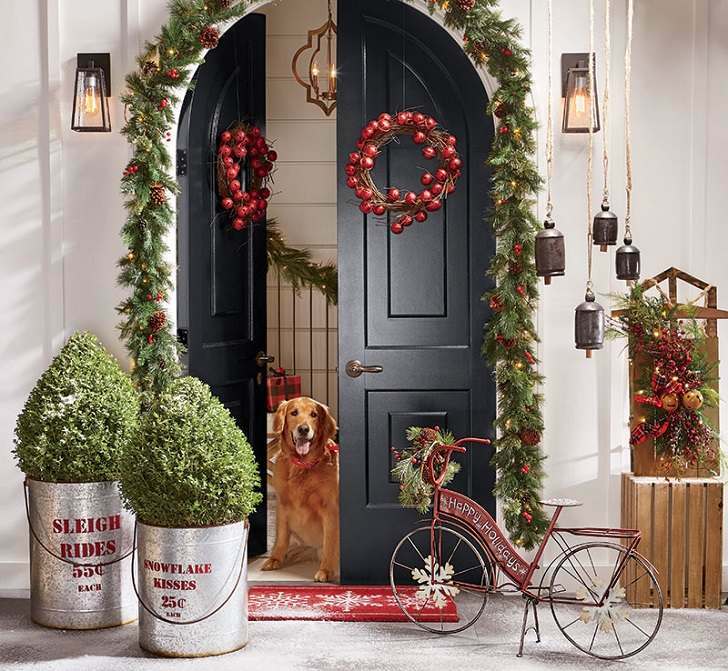 How to hang wreath on front door? Front doors can be made of wood or metal so you will need a different approach. 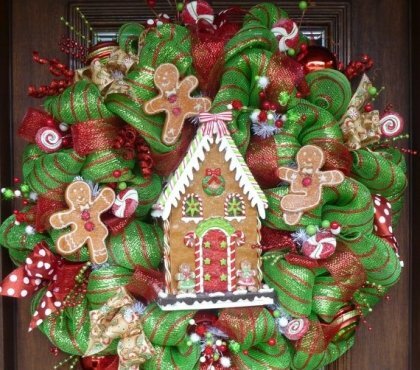 The main idea is to fix the wreath without harming the surface of the door. The first option is to use an over-the-door hanger. These can be used for wooden, metal or glass doors and will work perfectly. 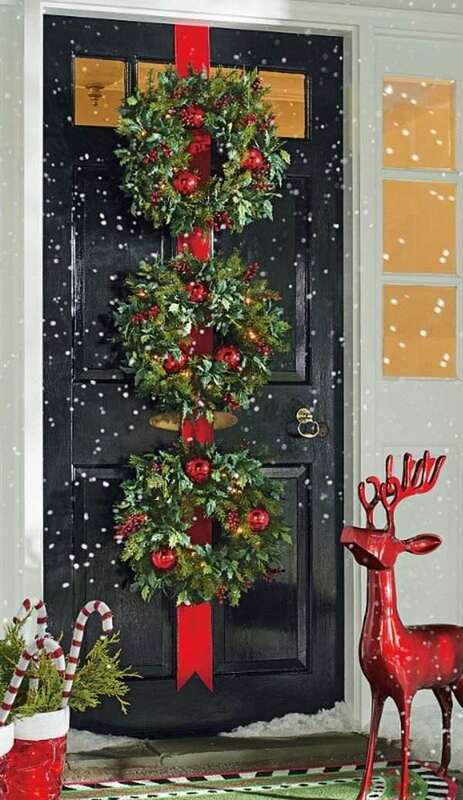 Usually, these are metal or plastic hangers with a curve which allows the wreath to lie flat against the door. The market offers many models and this is one of the most budget friendly options. Another option to hang a wreath without using nails is to use double sided tape. This option, however, is more suitable for small-sized models. 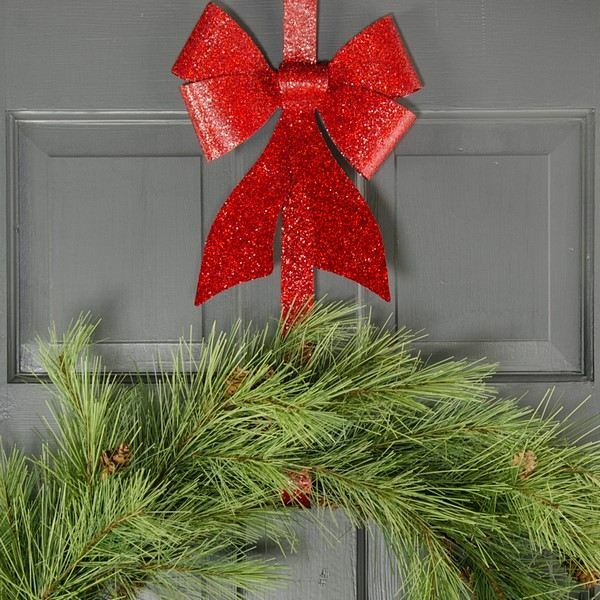 If you need to fix a large and heavy wreath you need to place tape on three or four places. A major disadvantage of this method is that the adhesive may leave traces on the surface of your door. 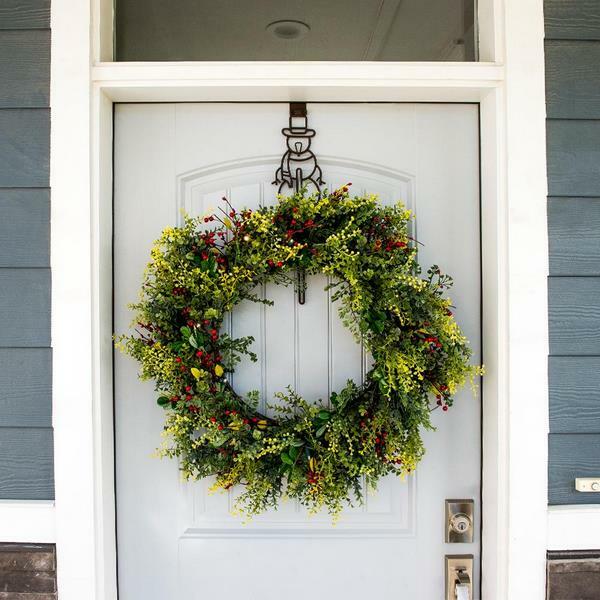 To hang a wreath on a wooden door without nails you can use some ribbon and fix it at the top of the door with flat thumbtacks. What can be easier than that! A magnetic hanger is a good idea for metal and steel doors. Magnetic hangers can hold up to 10 lbs of weight so you will not have to worry whether your decoration will still be on the door in a day or two but always check the capacity. Further to that, check if the magnetic hanger comes with protective pads before you buy it. If not, make sure that you add one to prevent scratches on the door. 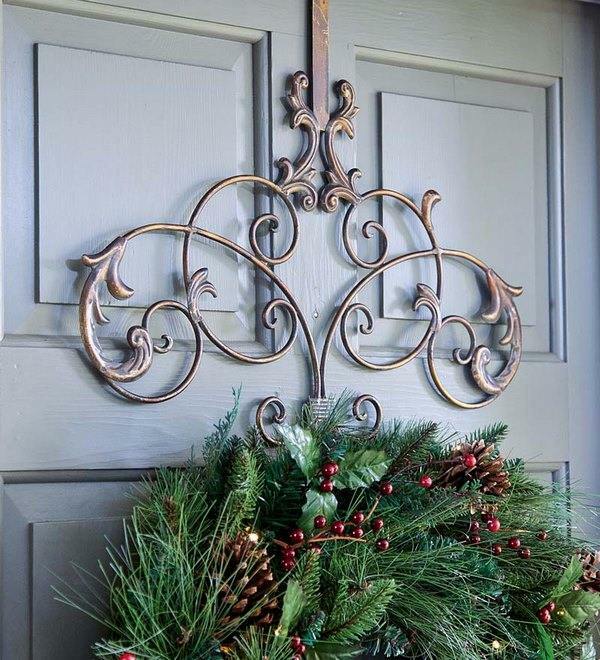 Command hooks are a budget friendly option to hang a wreath on a door. They support different weight so you need to have an idea how heavy your wreath is. Remember that command hooks need a clean surface to adhere properly so before placing them on the door you should clean the surface with alcohol. 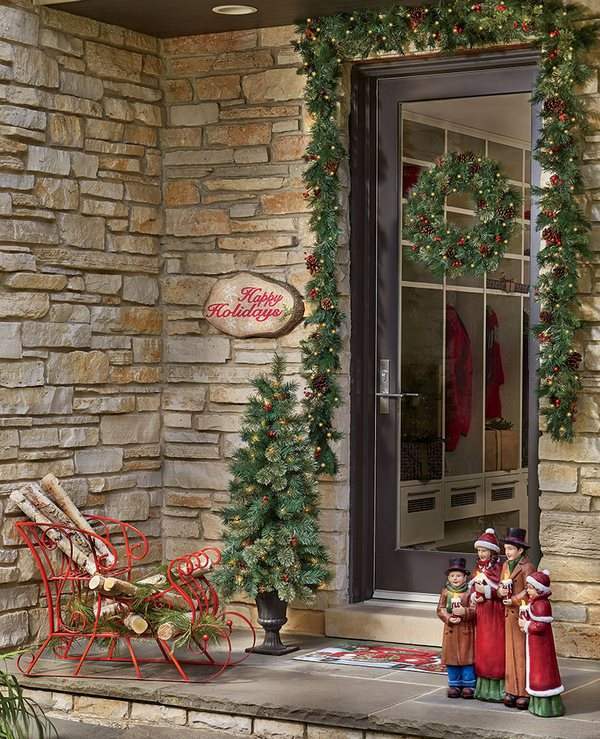 How to hang a wreath on glass door and windows? Hanging a wreath on a glass door, especially if they are entirely or mostly glass, and windows can be a little bit trickier. However, there are great ways to do that without scratches and unpleasant marks. Of course, all that we mentioned above – a metal hanger or a magnetic hanger can be used. Suction cups are a good idea and they can be easily removed after the holidays when you want to take your decoration off. You need to buy a clear hook so that it is not noticeable. What you need to remember is that the glass should be clean before you stick the cup and that you have to check the weight capacity. 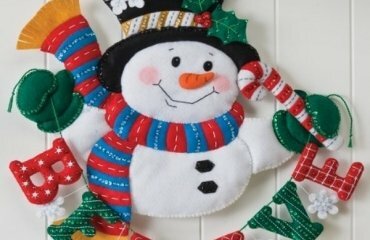 These hooks are recommended for small sized wreaths that are lightweight. The market offers hooks of different sizes and weight limits, 1/2 lb, 3 lb, 5 lb so make sure you get the right ones. A great DIY wreath hanger idea is to use clear fishing line or ribbon. This will work great for small wreaths, as well as tree ornaments and you can simply string the fishing line through the wreath and attach it to the top of the glass door. 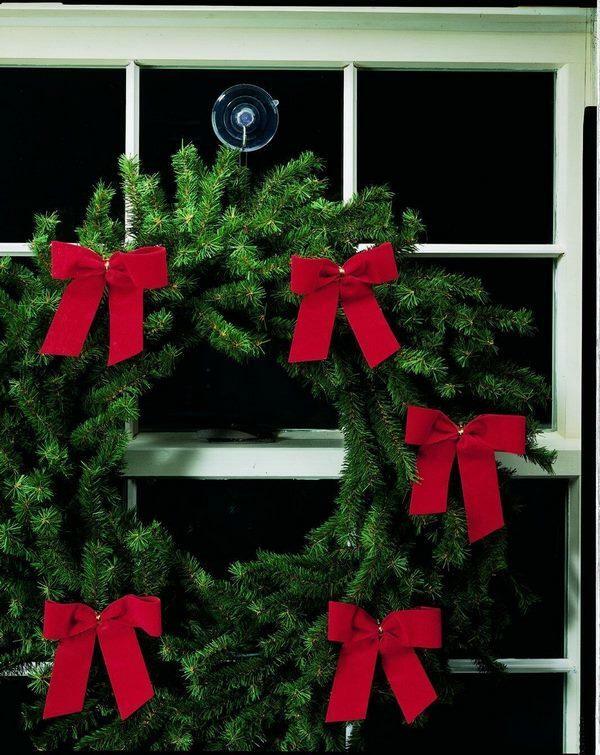 To hang wreaths on interior window without much effort and without making holes, you can use an adjustable rod and place it above the window frame. With the help of ribbons and fishing line you can create a beautiful composition. 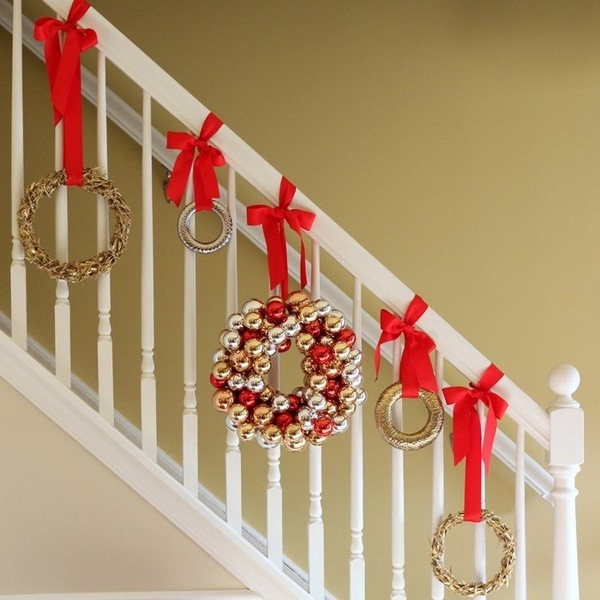 When you want to decorate your interior staircase with wreaths you can choose between a variety of methods. 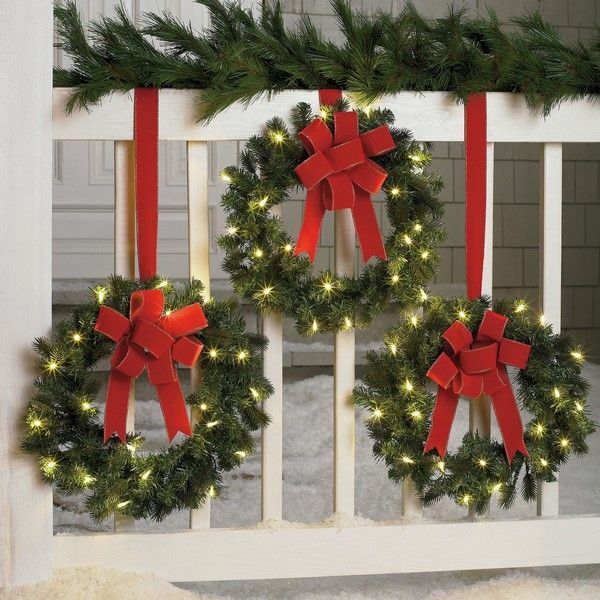 The first and easiest one is to use ribbons and tie the wreaths to the railings. 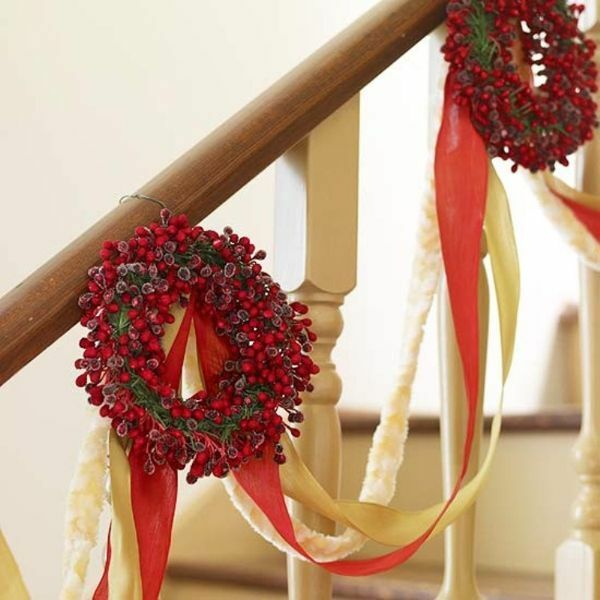 Another option is to buy banister garland grabber clips and use them as “hooks” for the wreaths. 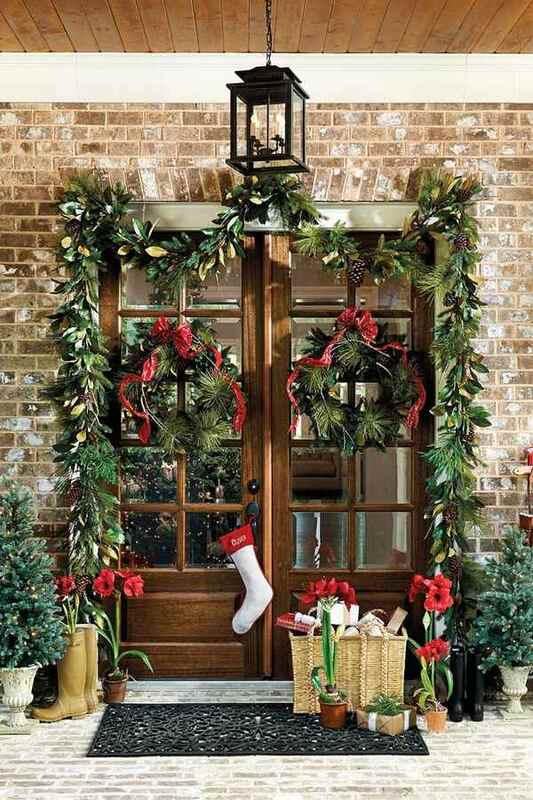 Of course, you can combine a garland and wreaths decoration and once you place the garland on the banister, tie the wreaths to it with ribbons. 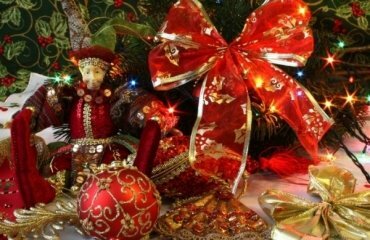 Florist wire is also an option and depending on the style of your festive decoration you can use burlap, twine, tartan, etc. 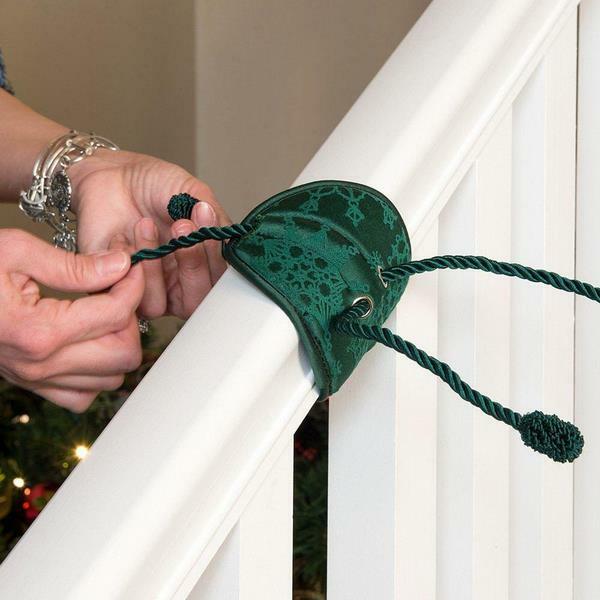 In many shops you can find special banister saver garland ties which will protect it from scratches and damages. 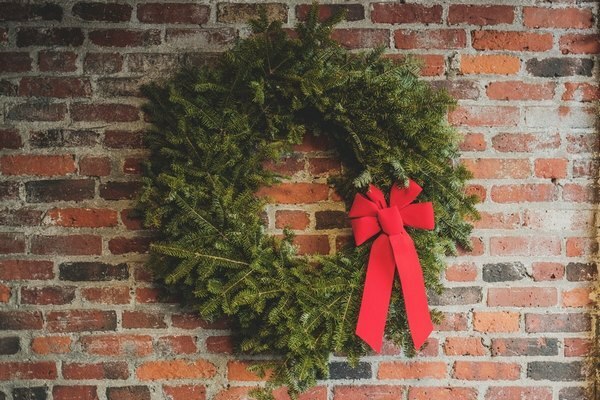 How to hang a wreath on a brick wall? Those of you who have a brick wall and want to hang a wreath without drilling holes in the wall, may use spring-steel brick wall hangers. They are designed to support up to 25 pounds and snap easily into a brick wall. Double-sided tape is also an option but make sure you get industrial grade tape which is manufactured to hold up to 5 pounds. 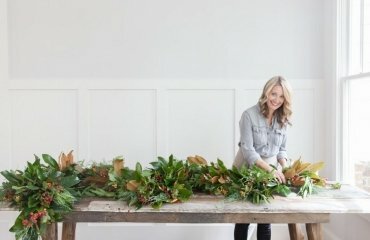 How to hang a wreath on a chandelier? 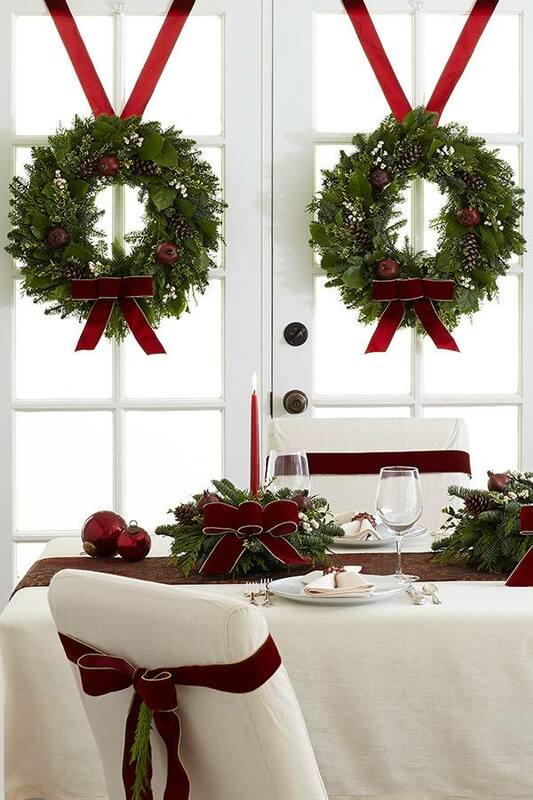 A wreath floating above the dining table looks magnificent and adds to the festive atmosphere in the home. How to hang it? Well, here are some ideas for you. 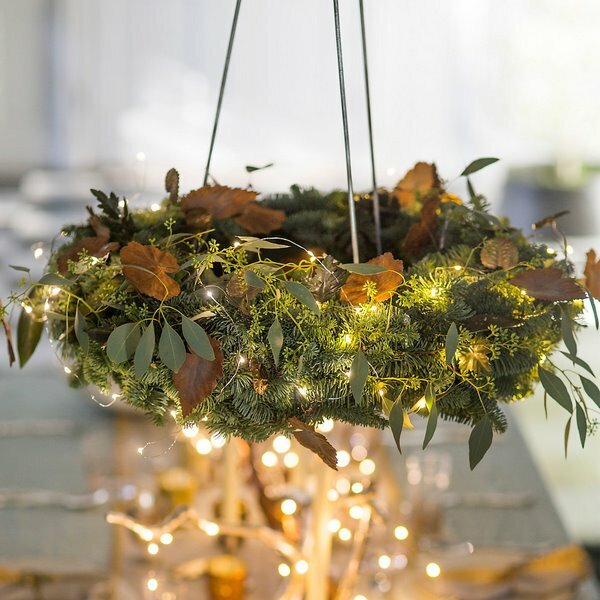 One of the options is to buy a special chandelier wreath hanger. It is fixed to the ceiling and will support your decoration without any problem. 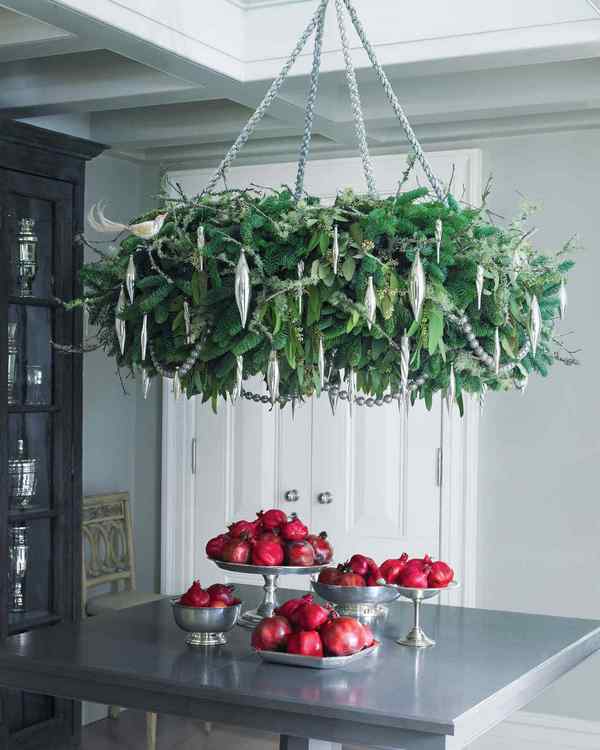 Those of you who prefer creativity can decorate the chandelier above the dining table and arrange it look like a wreath. 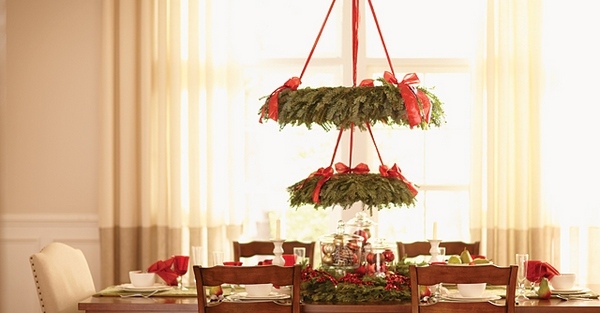 A very quick, easy and cheap way to hang a wreath over the dining table is to use ribbons. You can simply tie it to the chandelier and your decor will be ready in minutes! 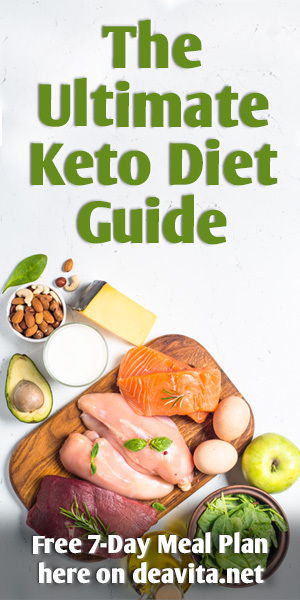 Look at the ideas in the gallery below and get ready for the holiday season!